Heat pumps are central heating systems that are extremely efficient and so cost very little to run. Simply put a heat pump is a fridge that works in reverse. If you put your hand behind a fridge you will feel that it is warm - the heat has been taken out of your fridge and put into the kitchen, cooling the interior of the fridge and warming up your kitchen. A heat pump does the same thing but on a larger scale, it takes the heat from the air or ground (or water..) outside and transfers it inside a building. 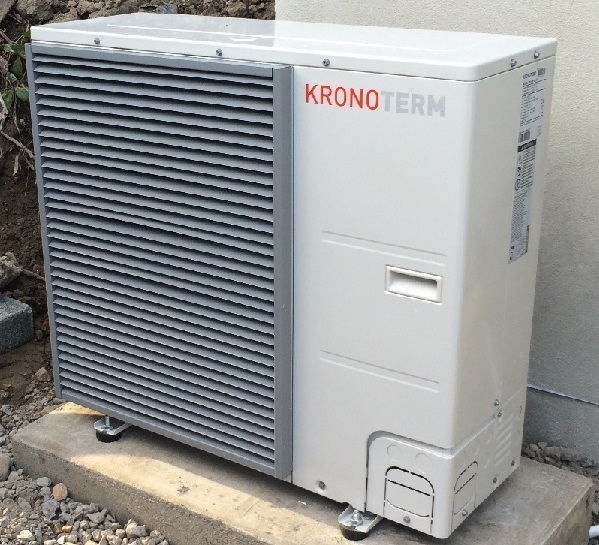 In Ireland we typically use Air to Water heat pumps which use the Air as the primary source of heat. Ireland has a very temperate climate and so does not experience very cold Winters as a rule - outside temperatures rarely fall below -3 deg C in winter and for the most part stay above zero. Because of this Air to water heat pumps perform extremely well in Ireland. Air to water heat pumps provide heat by using the outside temperature to turn a refrigerant liquid into a gas which is then compressed. When a gas is compressed it exerts heat, this heat is then used to heat your home or building. The main benefit of an air to water heat pump to a home owner is very high efficiency resulting in low heating costs and low greenhouse gas emissions. To extract the heat from the air air to water heat pumps have an outside heat exchanger unit called an evaporator. This looks a little like a car radiator with lots of fins but instead of expelling heat to the air it takes heat from the air. The air is moved through the heat pumps evaporator by a fan whenever the heat pump is on. The heat pumps evaporator runs a refrigerant liquid through it which boils at a very low temperature. Air to water heat pumps can heat your house or building even when it is as cold as -15 degC outside. This refrigerant is then compressed or ‘pumped up’ to a higher temperature by the compressor just like in your fridge. This heat is then passed to the water that circulates around through your radiators or underfloor heating to heat your house. Heat pumps work best heating underfloor heating but can just as easily heat radiators that are sized a little bit bigger. Heat pumps can also heat your hot water for showers and sink water. Heat pumps are fantastic at providing heat for space and water heating and they also marry well with other energy technologies provided by Glenergy. For example by combining heat pumps and solar panels you can produce an equivalent amount of electricity that the heat pumps will use so you are effectively getting a free heating system. See below for a video testimonial from one of Glenergy's previous customers who combined space heating heat pumps with hot water heat pumps, underfloor heating and solar panels.